It’s no secret that we love pizza in our house. We could eat it for lunch or dinner or both every single day. However, having just plain “cheese” or “turkey pepperoni” can get boring, so we are experimenting with different flavors and foods we love. After all, just about anything can be a pizza, right? 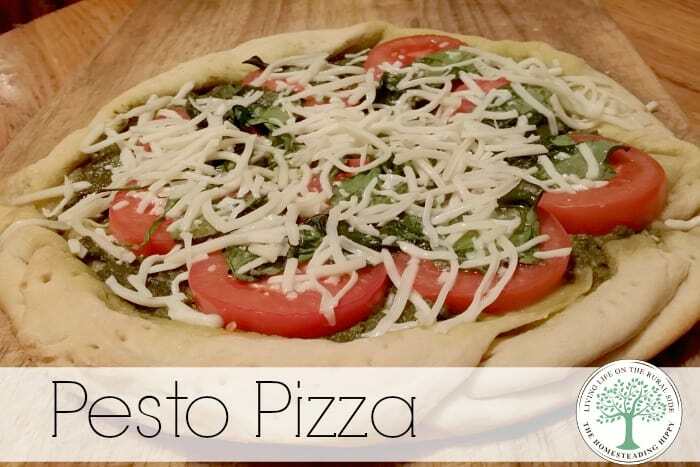 I bring you our pesto pizza. We love pesto and I usually make a large amount of it each year from our garden and freeze it for all winter long. However, this year, I didn’t get enough basil to make proper pesto, so we used spinach pesto to make this. But, it has such a delicious flavor to it anyway. It’s simple and easy to make, and the kids really loved it, which was rather surprising since they are the “cheese only” fans here. Simply start the dough by adding the yeast, oil and sugar to the water. Allow to proof 5 minutes, then add the flour and salt 1 cup at a time. Knead in mixer for 10 minutes or by hand for 15 until a smooth, elastic dough. Allow to rest while oven is preheating to 400 degrees. Smooth the dough on a pizza pan or in a cast iron skillet and pierce with a fork. Bake for 10 minutes. Remove from oven. Add the pesto sauce (get the recipe here), sliced roma tomatoes, and extra spinach on top. I also drizzle a bit of olive oil and a sprinkle of salt, but that’s optional if you choose not to. Place back in the oven for 20 minutes or until crust is baked and golden brown on the bottom. Sprinkle a bit of mozzarella cheese on top, slice and serve! This looks delicious. I’ve been looking for a healthier pizza option to make with my kids since they are OBSESSED. I’ll give this a shot! That looks great! I use a sourdough pizza crust but the toppings would be amazing on that I’m sure!